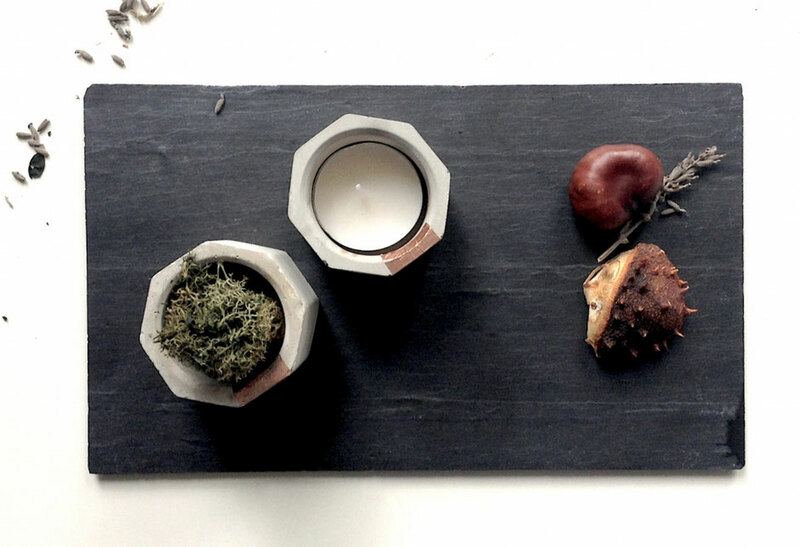 You can use any vessel really but as you can imagine I love concrete and my geometric bowl, I use my prototype here, is my go to choice for things like this. 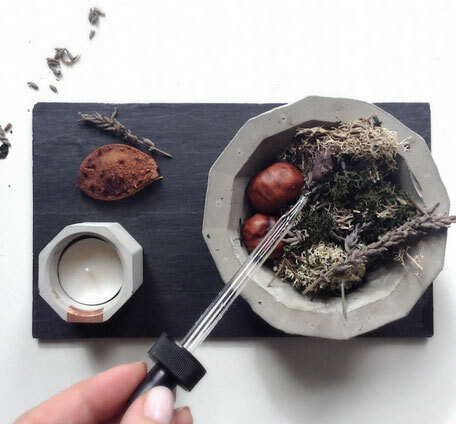 I place a base of reindeer moss inside the bowl, a mix of pale and dark green, some chestnuts and a bit of lavender. Some of the lavender is crushed, some is just placed to be nice on the eyes. To top it off, I add a few drops of peppermint oil. The moss and the concrete will allow the fragrance to fill the room for a couple of weeks. Time to cozy up, winter time is approaching and the autumn colours are wonderfully warm and inviting. To me this is reason enough to change things around, decorate and fragrance my few bowls and candle holders. I always use some reindeer moss as a base, it is not only good to fit Air Plants but it allows to create a nice nest for everything you want to add to your potpourri. I found some chestnuts and have harvested my lavender this year. And of course my favourite essential oil, peppermint. 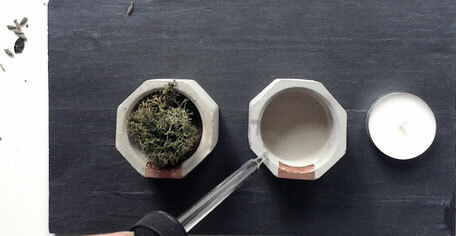 For my bathroom I use the smaller hexagon concrete copper cups. I add a little dark green moss and some essential oil. Whichever fragrance you fancy will be wonderful and that's it, ready to enjoy! Perfect for these long cozy evenings are candles and although they are available in all sorts of shapes and scents, I only have simple white tapper or tea light candles in my home. But don't worry about me, I add a little essential oil to the inner side of the concrete vessel itself. The concrete will take it on and when the tea light is burning the concrete gets warm and releases the fragrance. Mmmh.... lovely! Let me know, how you are getting on! 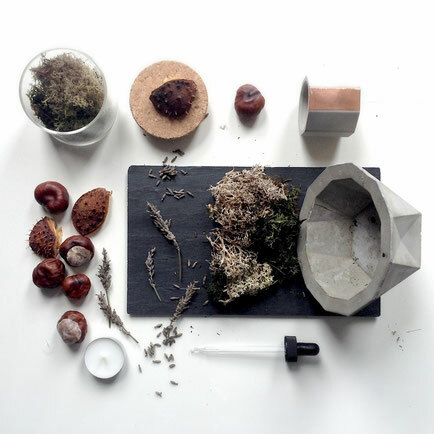 A little concrete copper winter display featuring your favourite fragrance if you like! It’s nice. I just love it. Thanks for sharing this post.